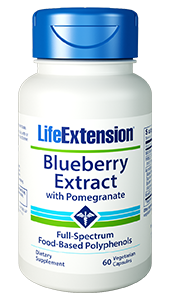 ComfortMAX™ from Life Extension is a supplement designed to nutritionally support those who are experiencing nerve discomfort and other forms of irritation. Includes PEA and Honokiol for anti-inflammatory and GABA neurotransmitter support. 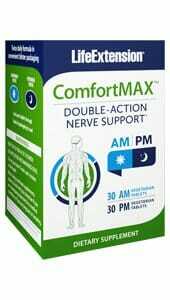 ComfortMAX™ from Life Extension is designed to nutritionally support those who are experiencing nerve discomfort and other forms of irritation. Includes PEA to help inhibit the secretion of inflammatory compounds, while honokiol modulates and supports the health of GABA neurotransmitters which play a role in signaling nerve discomfort. Separated into AM and PM tablets for sustained relief. The key to the nerve comfort support provided by ComfortMAX™ is a unique type of fatty acid called Palmitoylethanolamide (or PEA). PEA is produced organically in the body as part of a natural inflammatory and immune response. Its primary role is to inhibit the secretion of inflammatory compounds by white blood cells called mast cells. As the human body ages, these mast cells become increasingly sensitive and easily-agitated, causing them to secrete inflammatory compounds at an accelerated rate. This secretion is thought to be the source of nerve discomfort and unpleasant stimuli in response to stressful conditions. PEA supplementation has been shown in a controlled trial to outperform standard nutritional treatments for inflammation and nerve discomfort.1 Certainly a promising alternative for supporting healthy inflammatory and immune response. Only two factors set the PM tablets apart from the AM tablets: a smaller dose (30 mg) of calcium, and the inclusion of honokiol – a lignan compound which is found in most plants within the magnolia genus. Its nutritional benefits are based in its ability to support the function of GABA receptors in the brain. These neuro-modulating effects are thought be the source of honokiol’s purported relaxing and soothing qualities. In addition to this, GABA receptors are thought to have an impact on how the brain responds to signals of pain and discomfort.2 This combination of benefits – relaxation and the easing of nerve discomfort – make honokiol a perfect addition to the ComfortMAX™ PM tablets.